Encyclopedic, text book, and precise. This is a wonderful teaching tome for those interested in cooking, cooking and science (a la Harold McGee), modernist cuisine, and molecular gastronomy. Oh, and for anyone who is a fan of the amazing, wonderful superstar chef Ferran Adria and his generous teachings. There are other grand chefs referenced or featured in this multi-volumed set, and it is very interesting reading. I might be biased, as I took a class on science and cookery that I found extremely intriguing and improving, but I do think that anyone who enjoys cooking or who is even slightly interested in why things cook as they do would love this title. It is a bit expensive, but I would say it is worth buying if you have a serious interest in cooking. Also, it is more a book to reference and concentrate on certain sections rather than to read cover to cover. Unless, of course, you are a student of cooking. This may not be the most appetizing imagery when discussing a cookbook but Modernist Cuisine has blown my mind. I meant to have this review done over a month ago but I just couldn't skim these amazing books after all. I ended up reading most of this 50 pound behemoth, my mind whirring with all sorts of revelations and notions. Nathan Myhrvold, Chris Young and Maxime Bilet have created something that cannot just be called a cookbook. Yes, there are recipes--mostly in volume 5 and 6--but I found the first four volumes to be where the real meat of this series was. Volume Two is "Techniques and Equipment" and it appears to be the largest volume in the set. The title is pretty self-explanatory as well. 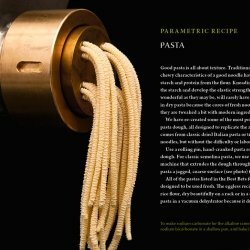 It covers classic and modern cooking techniques and talks about some of the equipment that you would find in a modernist kitchen. 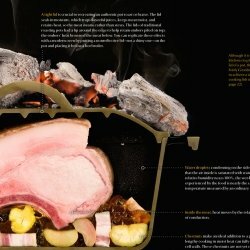 The most important technique seems to be "sous vide"-- cooking food in a water bath for even temperature distribution and control. 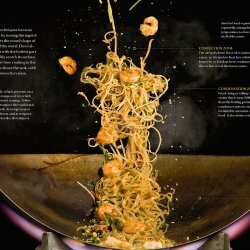 If you ever wanted a better understanding of how each cooking technique (eg., boiling, broiling, sautéing) actually works, this is the place to look. 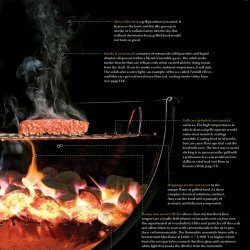 Because of the large amount of information overload, the only thing that I took away from this volume is that when we go grill shopping this summer, we will be looking for a non-dome-shaped charcoal grill -- avoiding the uneven heat distribution of the dome and the flavorless cooking of a gas grill. I wish I could have absorbed so much more from this one! Volume Three may be the most detailed volume though it is simply called "Animals and Plants". The first half--Animals--presents what the authors believe are the best ways to prepare many of the edible animals out there, from shellfish to duck. I have to say that it was a bit disturbing to see a picture of a live octopus that mentions its "curiosity, cleverness, and mischievousness" (pg. 3-24) on the opposite page from a mention of the many techniques to tenderize their tough flesh. But if you are looking for techniques for anything from squaring a large cut of tuna for sashimi to making sausages, it's probably in here. And then there are the Plants, fruits and vegetables, but this part of the volume is much smaller -- leading me to believe that either the authors are satisfied with many of the existing cooking and presentation methods for them or that they are not as central to modernist cuisine as meat is. Although, it could also mean that the techniques and preparations shown can be used on a wide variety of plant foods and don't need to be repeated in every iteration possible. After reading this volume, I definitely added a vacuum sealer to my kitchen wish list for quick marinades. Volume Four is called "Ingredients and Preparations" and this is another highly interesting volume. From curing to gels, this volume covers all sorts of daunting techniques. 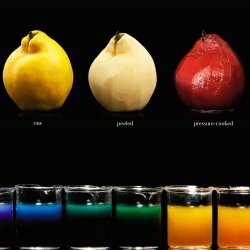 I got a bit lost among the many specialized ingredients used to create gels, emulsions and more. But I now know (theoretically) how to make the perfect cup of espresso. In Seattle, this is a much-coveted skill! Volume Five finally brings everything together into Plated-Dish Recipes. This is the only volume that I really skimmed. It appears that I'm more interested in the theoretical side of cooking than in the practical side. I guess this is where I admit that I'm much more adept at baking that cooking and that my techniques tend toward the simple, one-pot variety. Still, to see all of the possibilities out there makes me feel just a bit more adventurous and one day I might try a true modernist plated dish. There is also a final volume--Kitchen Manual--that does not fit in the case but is spiral bound, something any cook will appreciate. This is the volume that most resembles a standard cookbook but without any of the 3500 pictures that grace the other five volumes, as it is the practical companion to the others. If I was to copy out one recipe to try later, it might be the Cantonese Fried Rice, now that I know the true role of high heat in a stir fry. Then again, it might be the Meyer Lemonade -- if I happen to have some fructose, citric acid and gum arabic around. Of course, it could be the Flank Steak Sous Vide with the Sweet Potato Fondant and a Salted Caramel Apple Puree for dessert. Or I could just hire a personal chef. Yes, I think that's the solution. Modernist Cuisine contains some amazing and revolutionary photography including many "cut-away" shots -- like this one of a pot roast in a dutch oven under coals. I wish I could share more of the photographs with you. They are part of the reason that I took so long getting through these volumes. They are truly works of art in their own way. And I have to say that the authors are surprisingly not snobbish about food at all. They are just as interested in making the perfect burger and fries as they are in the perfect fois gras. This made for a much more enjoyable reading experience than I expected.